Fee: $24/$19 members - includes an autographed copy of The Radium Girls: The Dark Story of America's Shining Women, refreshments from MKE Localicious, and admission to the sculpture garden. Come early to stroll the grounds. Registration is closed. For info on future events, sign up for our e-list. Lynden Sculpture Garden's Women's Speaker Series and Boswell Books welcome Kate Moore, author of The Radium Girls: The Dark Story of America's Shining Women, to the Lynden Sculpture Garden, Thursday, October 11, 7 pm. For more information on upcoming Women's Speaker Series Events, click here. The First World War rages across the globe, and hundreds of young women toil amidst the glowing dust of the radium-dial factories. 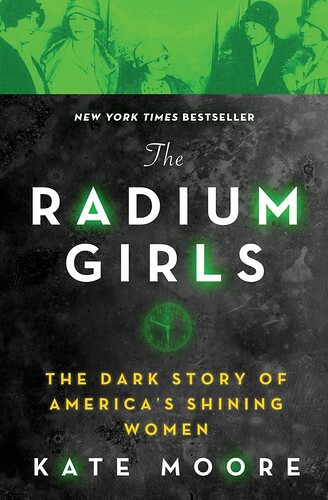 With such a coveted job, these “shining girls” are the luckiest alive—until they begin to fall mysteriously ill.
As the fatal poison of the radium takes hold, their hopes and dreams crumble in one of the biggest scandals of America’s twentieth century, and a groundbreaking battle for worker’s rights. The Radium Girls: The Dark Story of America’s Shining Women by Kate Moore is a rich, historical narrative of the young women exposed to the “wonder” substance of radium and their brave struggle for justice. Their courage and tenacity saved many others, led to world-changing regulations, and even prevented nuclear war. Written with a sparkling voice and galloping pace, The Radium Girls is the first book that fully explores these women’s strength in the face of almost impossible circumstances and the incredible legacy they left behind. Kate Moore is a Sunday Times bestselling author with more than a decade’s experience writing and ghostwriting across varying genres, including memoir, biography, and history. In 2015, she directed a critically acclaimed play about the Radium Girls called These Shining Lives. She lives in the UK. Visit her at Kate-Moore.com.